Pre-bake a 9″ pie shell until golden, and cool it. Preheat oven to 400F, and read ALL of these directions before proceeding. You will need 3 eggs, carefully separated into yolks and whites; it is of extreme importance that no trace of yolk gets into the whites, or the whites will not stiffen up properly. Put saucepan on stovetop, and cook over medium heat, stirring constantly, until thickened. Cover and cook for 2 minutes longer, stirring occasionally. Whisk in a little more of the hot mixture, then, blend the yolk mixture into the remaining hot mixture in the saucepan*. Continue to cook for one minute longer, stirring constantly. Cool to lukewarm and turn into prepared pie shell. Immediately spread onto the pie, making sure to touch it to the edges (it will shrink back if you don’t). 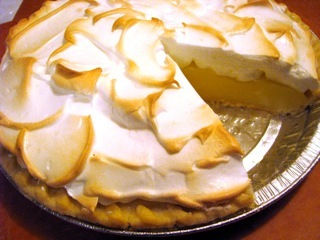 Put the pie into the 400F oven for about 5 minutes, or until the meringue is golden. Let the pie cool to room temperature before cutting. *Note: You can add 2 teaspoons of the lemon zest when you add the egg yolks, reserving 1 teaspoon. After removing the mixture from the heat, pass it through a sieve, then stir in the remaining 1 teaspoon of zest and the remaining ingredients. This will result in a “smoother” filling. Butter a 9” x 5” loaf pan or a 12-cup muffin pan (preheat oven to 375F); will make 9 muffins. In a large bowl, cream butter and sugar. Beat in egg, lemon rind and juice until well mixed. In a separate small bowl combine yogurt and milk. In another separate bowl, whisk together flour, poppy seeds, baking powder and baking soda; add to wet ingredients alternately with yogurt/milk mixture, mixing just until incorporated. Do not overmix! Pour into prepared pan, bang pan on counter to release air bubbles. Bake for 35 to 40 minutes or until tester inserted into centre comes out dry (if making muffins, bake for 15 to 20 minutes). Glaze: Prick holes in top of loaf (or muffins) with a skewer or fork. Combine icing sugar with lemon juice; pour over loaf. I’m an admitted pastry-phobe, even after a very patient friend gave myself and another pastryphobic friend lessons! That’s why I really like my friend Roberta’s pat-in-pan sweet, cookieish recipe for fruit pies. I make a sour cherry filling for this from my friend Tovah’s recipe collection. Just mix all of the ingredients together with a fork or a spoon, or even your fingers. It will be kind of powdery and crumbly. Reserve about 1/3 of a cup of the crumbs for sprinking on top of the pie. Press the remaining crumbs into the bottom and sides of a 8″ or 9″ tarte pan (I use one that has a removeable fluted side). Bake for 10 minutes until very set, but not browned. Note: if the shell is not going to go back into the oven, bake it until it is golden. Mix all ingredients together in saucepan; cook over medium heat until mixture thickens and goes clear (transparent). Spoon filling into crust. Sprinkle reserved crumbs over top of filling. Pop back into 350F oven, and bake for 10 minutes, until crumbs and edges of crust are golden. Let cool completely before cutting.